We’d love your help. Let us know what’s wrong with this preview of Girl off the Grid by Kenzie Hart. Love travel and reading? You'll love Girl off the Grid! "Girl off the Grid is a book with a real environmental message and a sweet, young love story." NYC fashion blogger, Camille Caldwell, gets offered a dream job by her favorite magazine. They're going to send her on an all-expenses paid eco-trip to Costa Rica. She doesn't know what that means, but she assumes she'll wear Love travel and reading? 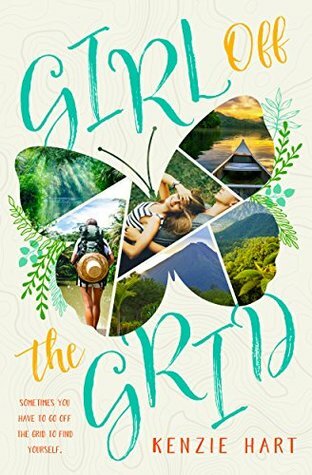 You'll love Girl off the Grid! NYC fashion blogger, Camille Caldwell, gets offered a dream job by her favorite magazine. They're going to send her on an all-expenses paid eco-trip to Costa Rica. She doesn't know what that means, but she assumes she'll wear fabulous clothes, sip Piña Coladas on the beach, and have her photo taken "out in nature." Really, the hardest part of the assignment will be giving up social media while she's gone. Going off social media is no big deal for London-based wildlife photographer, Adam Lloyd. The only reason he even has an account is to share his photos with the world. He's thrilled when an international publication wants to hire him, until he finds out it's a fashion magazine. He decides to take the job anyway--after all, it will be great for his portfolio. But the minute he meets Camille, he knows it was a mistake. She has too much luggage, is too high maintenance, and way too pretty. When they meet, their feelings are mutual--they hate each other. Can these two stop fighting long enough to complete their assignment? Will Camille give up and go home when she discovers there's nowhere to plug in her hair straightener? Published November 13th 2017 by Eclipse Publishing, Inc.
To ask other readers questions about Girl off the Grid, please sign up. Camille is a popular fashion blogger. Because of her follower base and her positive attitude a fashion magazine asks her to go on a trip to Costa Rica. It's an eco-trip and the magazine will pay for everything. She has to write an article and make some videos and a photographer will be joining her to take a lot of photos. There's one rule, Camille won't have any access to her phone or internet. She has to go off the grid for the duration of the trip. Will she be able to have a good time while be Camille is a popular fashion blogger. Because of her follower base and her positive attitude a fashion magazine asks her to go on a trip to Costa Rica. It's an eco-trip and the magazine will pay for everything. She has to write an article and make some videos and a photographer will be joining her to take a lot of photos. There's one rule, Camille won't have any access to her phone or internet. She has to go off the grid for the duration of the trip. Will she be able to have a good time while being so far away from home without the means to contact anyone she loves? Camille hasn't got much travel experience and she's used to certain luxuries. Her photographer Adam is an experienced traveler, so he can teach her some things. He doesn't care about social media and he's had a free childhood spent in many different countries. His father is a famous photographer and Adam wants to follow in his footsteps. Working for a fashion magazine is not exactly his biggest dream, but it's a good start of his career and he'll be able to take many stunning photos in Costa Rica. When he meets Camille she's too much for him. She's bubbly, spoiled and beautiful and it's better if he keeps her at a distance. However, is it possible to dislike someone as upbeat and charming as Camille? Girl off the Grid is an incredibly sweet romantic story. I immediately loved Camille. She's a sparkling person with a sunny personality that makes people's hearts melt. She's pretty and smart, which is a good combination. She's also high maintenance and used to certain standards, but after some mild complaining she makes the best of any situation, which is something I liked a lot about her character. Adam doesn't want to like her, but he doesn't know how to keep this up. Camille's cheerfulness is inspiring. I love how they challenge each other and how they make each other think about the important things in life. They have a really special click, even though they have conflicts and come from completely different worlds. That made reading about them interesting and fun. 3.5 stars ... fun to read! Facing fears, facing the unknown, taking life as you know it and watching it all change in the blink of an eye. Having everything to having nothing. Learning to live by means instead of by riches. Seeing the natural beauty of the world instead of seeing the world made up of grandeur. Learning to live out of your comfort zone, learning new things and new people and how to make things work that you normally wouldn't have had to. Camille learned new lessons in life. It was great to see her acclima Facing fears, facing the unknown, taking life as you know it and watching it all change in the blink of an eye. Having everything to having nothing. Learning to live by means instead of by riches. Seeing the natural beauty of the world instead of seeing the world made up of grandeur. Learning to live out of your comfort zone, learning new things and new people and how to make things work that you normally wouldn't have had to. Camille learned new lessons in life. It was great to see her acclimate to her new surroundings, to learn to live without all that she had before. Adam had a charm to him that I wasn't sure Camille would understand and come to love. I thoroughly enjoyed this book. I thought it was perfect YA book that showed the growth of the main characters. They were both charming in their own ways and were likeable, funny characters. The thing that struck me the most was the description of Costa Rica. The details of the animals and sites they see along the way made me feel like I was on vacation sitting right next to them and experiencing everything with them. I loved being swept away to another place and have a little chuckle at the same I thoroughly enjoyed this book. I thought it was perfect YA book that showed the growth of the main characters. They were both charming in their own ways and were likeable, funny characters. The thing that struck me the most was the description of Costa Rica. The details of the animals and sites they see along the way made me feel like I was on vacation sitting right next to them and experiencing everything with them. I loved being swept away to another place and have a little chuckle at the same time. I am a little disappointed. I did like the book, but I was hoping for a deeper romance between the two. I also would've liked a more solid conclusion about what happened with th magazine and once the two characters met back up. It felt like a little bit of a cliffhanger. I love travel romance novels. There aren't enough of them. It would have been nice to follow through with Camille's job ad well! I bought this book at a book signing and I thoroughly enjoyed it. It was different from my normal books I read so I wasn't sure what to expect. I loved both Adam and Camille and enjoyed watching their relationship develop and their personal growth. I especially enjoyed seeing Costa Rica through their eyes. This was a refreshing, sweet, enjoyable book. I look forward to more from this author. What a fun read! The setting of this book was so neat to read about- and this book managed to be educational while still being an enjoyable romance read! It was obvious that the subject matter was important to Kenzie Hart- such care was taken to teach us about the area and conservation issues. Loved the book. Kenzie did a good job, she made it feel like you are along on the adventure with Adam and Camille. You get to see another culture and see how you could make a difference like Adam and Camille talked about. It's a very inspiring book to read and will make you think. Highly recommend this book it's worth your time. Romances are never my first choice for reads, so I'm not sure what attracted me to this one anymore. Maybe it was a reminder of why I don't enjoy them. But I soldiered on and read this one and really, it's not awful. I am sure there are loads of YA's and others who are going to love this book! What's not to love? The girl, Camille, is a very popular fashion blogger sent on an exotic, all expense paid trip to Costa Rica! I'd grab that myself, in a heart beat, if offered! Sadly, she's saddled with Romances are never my first choice for reads, so I'm not sure what attracted me to this one anymore. Maybe it was a reminder of why I don't enjoy them. But I soldiered on and read this one and really, it's not awful. I am sure there are loads of YA's and others who are going to love this book! What's not to love? The girl, Camille, is a very popular fashion blogger sent on an exotic, all expense paid trip to Costa Rica! I'd grab that myself, in a heart beat, if offered! Sadly, she's saddled with Adam, a world class photographer, who is assigned to accompany her and film and photo the trip. They hate each other. But that will change over the course of the book! It was entertaining enough to hold my attention. Its a bit long, but I am sure it's fans will think it's not log enough! It is well-written and a fun light read for summer. Kenzie Hart graduated from the University of South Florida with a degree in Interdisciplinary Social Sciences: History and International Studies. She is currently living abroad to travel and pursue her Masters Degree. She can usually be found at the local coffee shop writing, reading, or planning her next adventure.